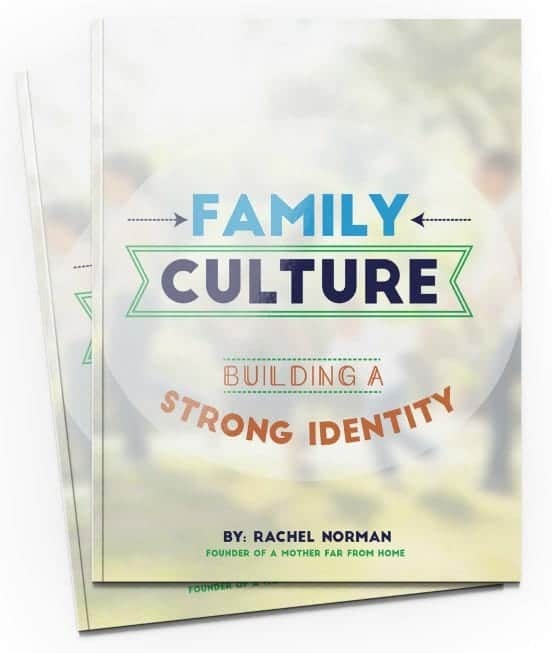 Family culture is so important and today’s topic in this series focuses on family identity. Before you go any further, have you read the first post in this series? If not, go back and read Part 1 on family culture, Part 2 on family values, and Part 3 on family traditions. My maternal grandmother walked miles to school every day and picked cotton by hand year in and year out. My maternal grandfather was the first farmer to bring a particular crop to our area and one of the first to make a very substantial living as a farmer. My paternal grandfather was a doctor in the Air Force and met with multiple presidents. My paternal grandmother was a nurse during the war where she met my grandfather. She gave me her red hair. Family history, identity, and legacy doesn’t just matter because it’s sweet to think about family trees. They aren’t just important so you have something to talk about when you’re giving kids a lecture on how easy their life is now compared to their ancestors. 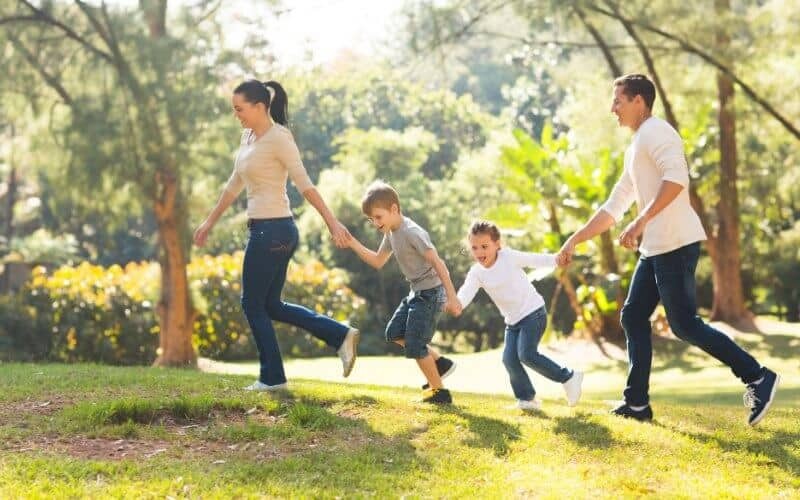 Research shows that family history and family identity actually help to forge stronger feelings of acceptance, belonging, and well-being within a nuclear family (source). When children sense they belong to something bigger than themselves they are actually happier. Thinking about and cultivating a strong family identity is so important in the overall discussion on family culture. I once read a quote from Beth Moore that said something like, “I disciplined meanness just as severely as I did lying or stealing,” and that rang true. When one of my children acts mean I want to fly off the handle because to me, meanness is intolerable in every sense. When thinking about our family identity – and brainstorming our own family culture – it became clear to me that I discipline meanness very strongly, perhaps too strongly at times. A reality became clear: Brotherly kindness is one of our core values. By figuring out what things identify your family (the history, the rituals, the values, the every day culture) you’re able to put words to concepts you live out everyday. The simple act of giving children vocabulary for family life goes a long way. We don’t make fun of each other, we are a supportive family. Like our family before us, we persevere even when times get tough. We do mission work because we live out our value of service. There is inestimable value in giving your children the gift of a family history. This is something perhaps harder than in days past since families are moving more frequently and children often grow up without any grandparents nearby. Even so, you can share stories that help children see where they come from. It’s not only royals who care about their lineage. Ancestry.com has a booming business helping you discover ancestors, living family members all over the world, and even analyze your DNA to tell you what genetic communities you’re part of. Kids need to feel part of something larger than themselves. By helping your children learn to identify with something bigger than themselves – the family unit – they are turning their focus outside of themselves. It’s a lot easier for kids to say no to peer pressure or risky behavior when they have something positive to do instead. In the book Why I Didn’t Rebel the author said the main reason many kids she interviewed were able to avoid rebelling is because they actually had something fun they wanted to do at home. Home life was fun. Families had good traditions, good times, and good talks together. This made it easier for kids to stay on the straight and narrow and avoid getting into trouble. When a family’s culture and identity are strong, nurturing, and affirming children grow up feeling part of something. Figuring out your family values will probably be fun. But even if it isn’t you gotta do it. We can’t expect our children to mine the depths of our hearts and then live out the things we value most. And, odds are in this fast paced frenzied world, we aren’t even living out our deepest values. But that can change. 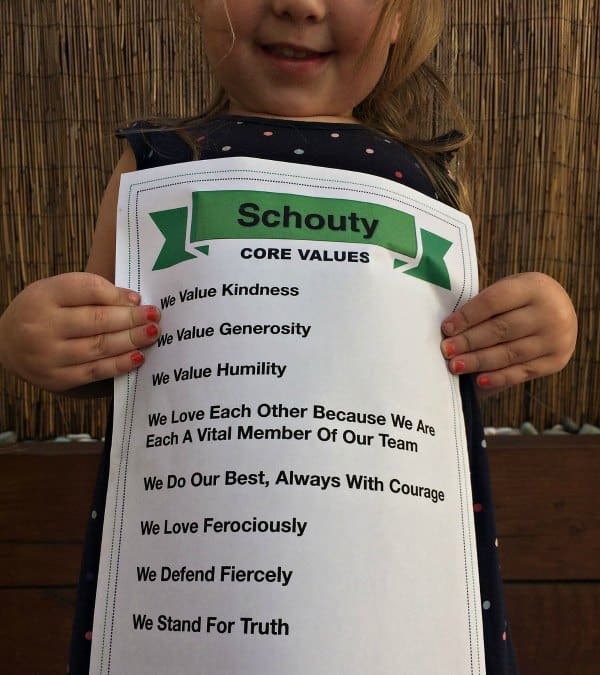 And it doesn’t have to be hard, we just have to put our values front and center. 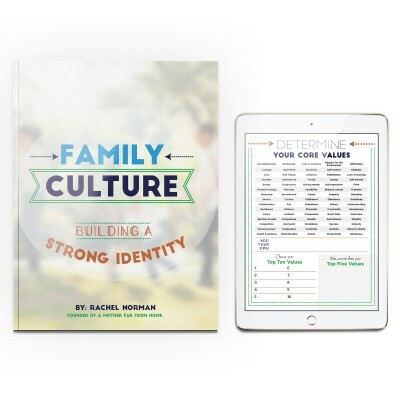 In my quest to strengthen our own family culture and help you strengthen yours, I made a beautifully functional Family Culture Pack for you. 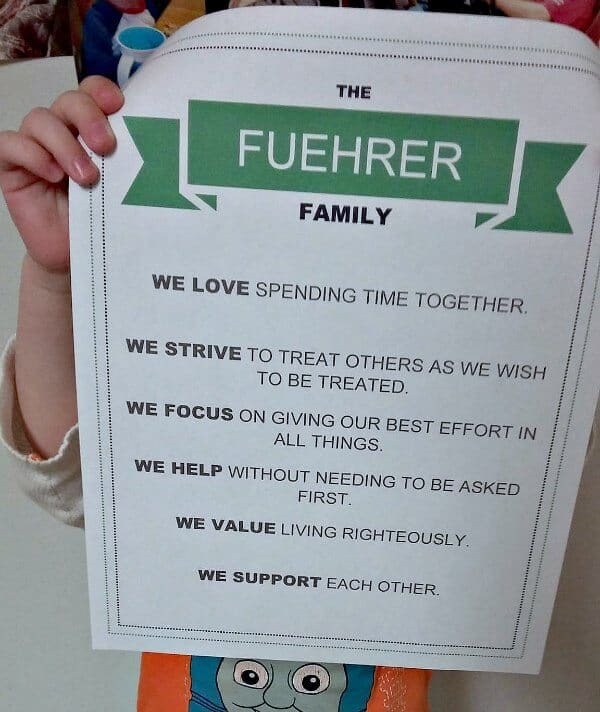 Use it to brainstorm your family values, then edit the template and print your own family values to frame or hang on the fridge. Nail down the aspects of your family culture you already have and those that are lacking. Begin improving your own family culture today. 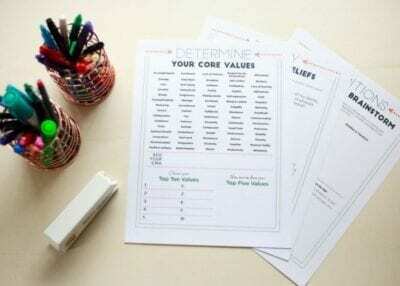 If you don’t determine and then live our your values… your children won’t either.